Why taking your idea directly to a Microsoft, IBM, Google or anywhere else is probably wrong – and how hackers teach us a completely different approach. The winner at the PITCH 2016, CareThread.com reminded us of a critical point for all Entrepreneurs: be careful which door you go through. Most companies are geared towards telling you no – if you are lucky – and getting a free look and chance to knock you off if they don’t. But then again, you might need to partner with them in some way. So how do break this conundrum. Last week’s winner and a notorious hacker’s story could show you just how…..
Nick Adams’ Care Thread sells a kind of secure “Twitter” service for healthcare, particularly hospitals. But knowing that hospitals are extremely cautious, they found a side door, a special critical care unit that really needed their solution and so, as they built trust they have been able to grow their user base. Most Startups with a great idea, tend to do just the opposite, they try marching in the front door only to be rebuffed, strung along or, in some controversial incidents, find their idea slyly misappropriated. Sometimes its coincidence, sometimes its venal. But in most cases it’s a big disappointment. 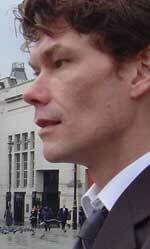 Gary McKinnon, the celebrated British hacker with self-described Asperger’s syndrome, is little known in the US but something of a folk hero in the U.K. is a useful example. He was able to penetrate the US Military and then NASA’s computers with an IBM PC XT and a 64K baud modem that he borrowed from his girlfriend’s aunt. Obviously, if he asked his nearest US military commander or a visiting astronaut for permission, they would have told him no. Perhaps they would have shot him. But when Gary explored the US military, which at the time was getting into online networking (this dates back to the early 2000’s) he realized that it included the mess halls too. Persuading ol’ cookie that he needed to share his password to get the potatoes delivered, or something along those lines, wasn’t that hard. From the kitchen, Gary assiduously worked his way up to the top of the military and then on to NASA, where he claimed he saw evidence of UFO’s. After almost 10 years, the US eventually gave up on trying to extradite Gary. He remains a folk hero in the U.K. and entrepreneurs every might want to borrow a lesson from him. So, when looking for a big partner, try a side door where you can prove yourself, create a dependency and prove the superiority of your technology.